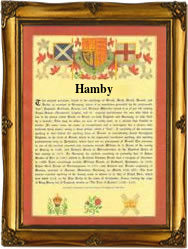 Recorded as Hambie and Hamby, this is a locational surname of Danish-Viking pre 8th century origins. It derives from a place in Lincolnshire which is now 'lost', although presumably in the Middle Ages was large enough to have created a surname which has spread widely. Some five thousand British surnames derive from such places, of which the only reminder today is the surname, often in many variant spellings. The name means the farm (bi) on the flat land (hamm), although given that Lincolnshire is almost entirely flat suggests that there may have been a more precise meaning. The original site was probably in the parish of Brocklesby, as it is in the registers of this area that the name appears in its greatest consistency. Locational surnames were created when a person moved away from his or her former home, this then becoming their surname as an easy form of identification. As the 'Hamby' nameholders only seem to have moved a very short distance from their original home, would suggest that the move may have been voluntary, most were not. Examples of early recordings include Elezebethe Hamby, christened at Brocklesby on January 9th 1535, and Ezabell Hamby, at the same place on July 10th 1538. Abigaile Hambie was chrtistened at Navenby on July 7th 1605, the first example in the alternative spelling. The first recorded spelling of the family name is shown to be that of Edwarde Hamby, which was dated May 1st 1531, married Elezabeth Bouth at Brocklesby, Lincolnshire, during the reign of King Henry V111, known as 'Bluff King Hal', 1510 - 1547. Surnames became necessary when governments introduced personal taxation. In England this was known as Poll Tax. Throughout the centuries, surnames in every country have continued to "develop" often leading to astonishing variants of the original spelling.